Any future derby girl or referee worth their skates has to first cut their teeth on 35 pages of essential rules reading before they can even think about hitting the flat track. At CRDL we believe that reading is one of the most enjoyable and essential skills for children and adults to learn, love and embrace. I couldn’t have put it better myself. 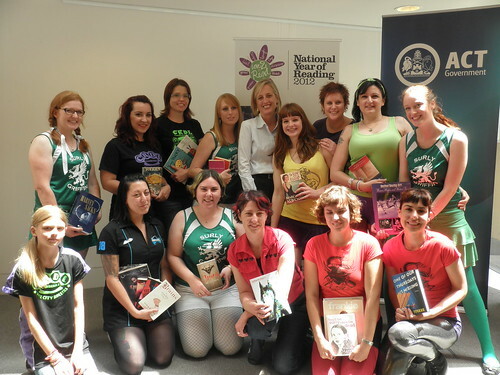 Make sure you check out the full list of national and state ambassadors and get involved with your local community in 2012 to spread the love of reading! the number of children who do not own a book is increasing. Seven years ago 1 child in 10 did not have a book of their own while today the figure stands at a startling 1 child in 3. The figure of 1 in 3 UK children without a book of their own equates to approximately 3.8 million children. about a fifth of children [surveyed] said they had never been to a book shop or a library. I suppose it’s not too surprising given the high number of UK library closures and the current state of the publishing industry, but it certainly is sobering. The National Literacy Trust is currently raising money to purchase books for disadvantaged (bookless!) children. You can support their efforts by donating online and receiving a lovely children’s book illustrator’s Christmas card in return. You could also buy someone small you know a book for Christmas. What will you be doing at 11 o’clock this morning? Does it involve reading about a little white dog? Yes, that’s right – today is national simultaneous storytime! All around the country, librarians and community members will be pulling out all the stops to promote reading and literacy in children by simultaneously reading from Bruce Whatley and Rosie Smith’s book “Little white dogs can’t jump“. Join in at a library near you! Cory Doctorow (the well known author, blogger, co-editor of Boing-Boing, copyright crusader) recently gave a speech at the National Reading Summit on reading and the way that copyright is currently working (or not, depending on your viewpoint). You can find the first part of Cory’s speech entitled “How to destroy the book” here and, when you’re done, do yourself a favour and read the second part as well. This and other brilliant library themed items available from the Unshelved website’s online store.